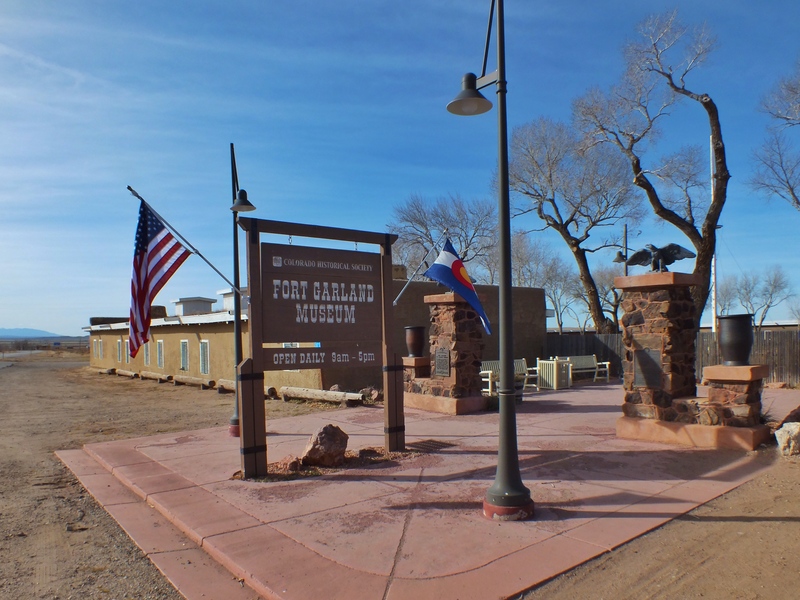 Fort Garland, in south central Colorado was an active military post for 25 years, from 1858 to 1883. It was built to protect settlers from Indians. Nothing much happened there. 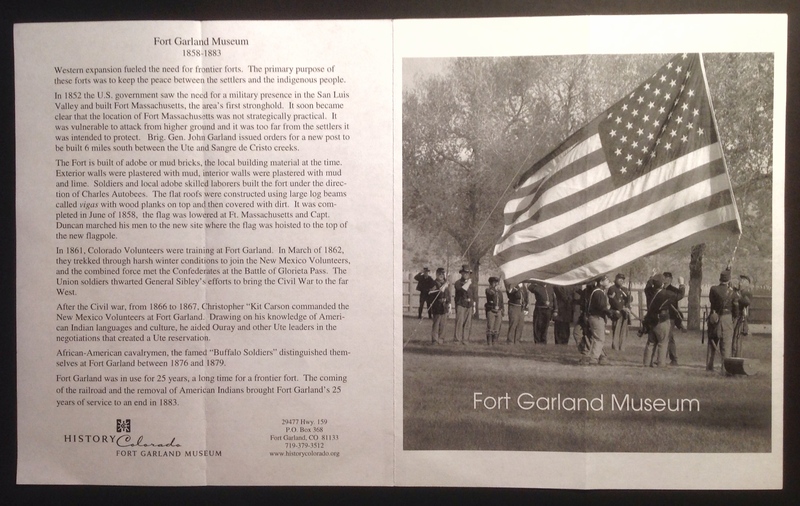 In March, 1862, Colorado Volunteers trained at Fort Garland, then marched south to join the New Mexico Volunteers. 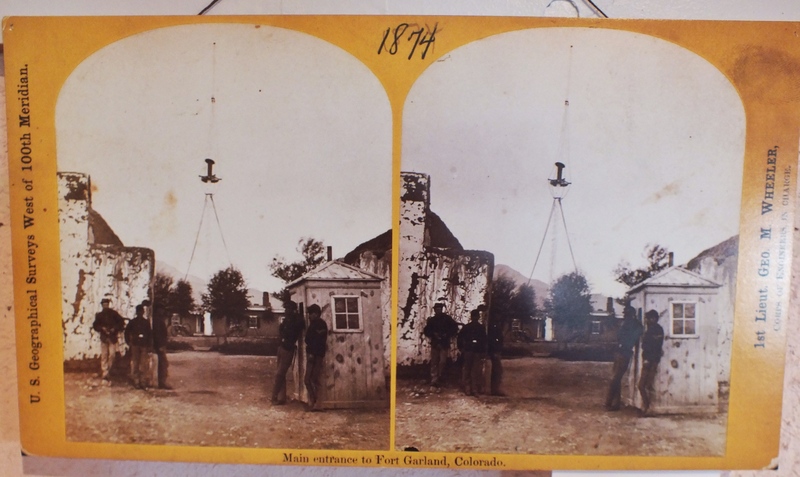 The combined force defeated Confederate forces in the Battle of Glorieta Pass, ending the Confederate’s attempt to invade the southwest. Kit Carson, famous mountain man and scout, was the commanding officer in 1866 and 1867. The post was so boring that one of the chief activities of the soldiers was tracking down deserters. 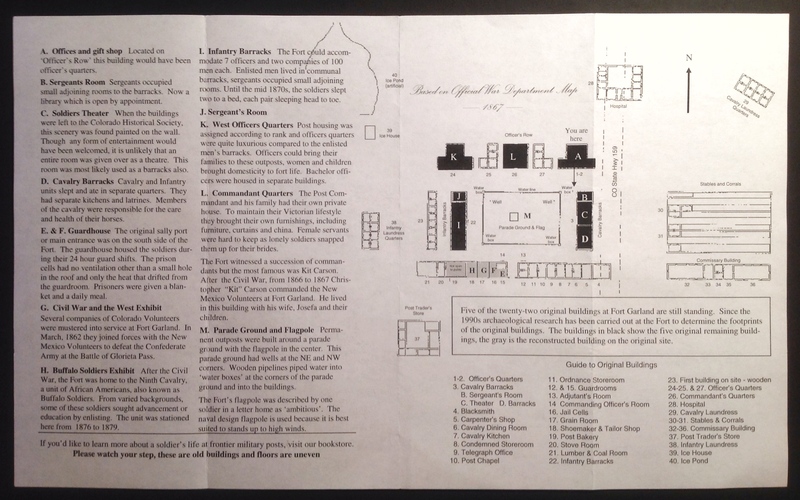 Five of the 23 original buildings remain. A sixth building has been rebuilt. 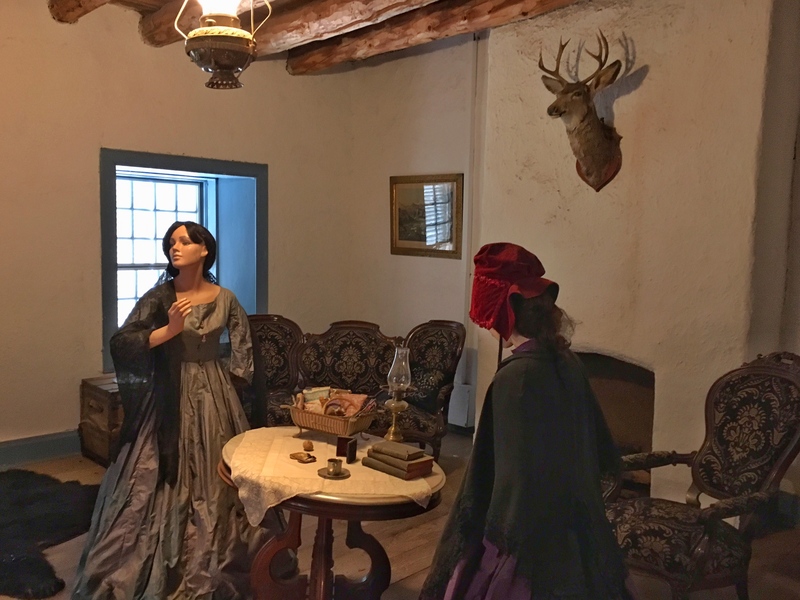 All of them house exhibits on life at the fort, the Civil War, and Kit Carson. We had the place pretty much to ourselves the entire time we were there. 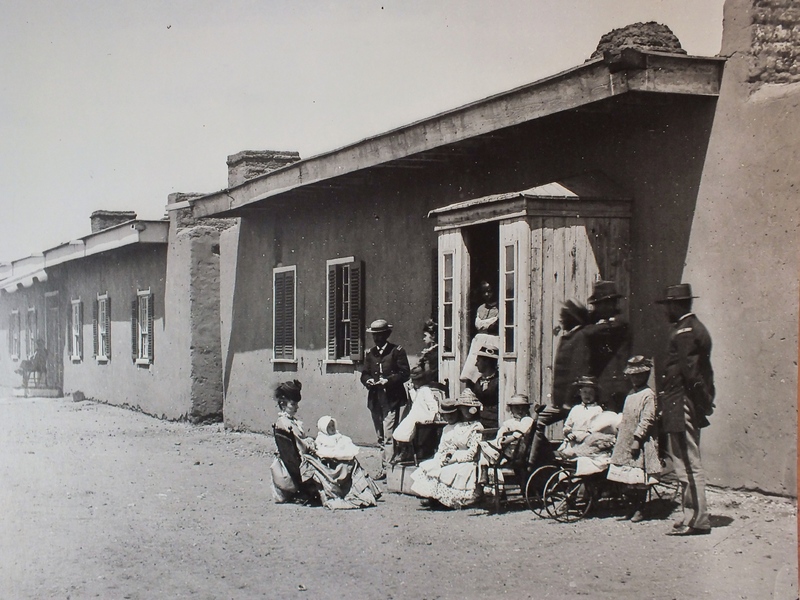 Outside the Officers’ Quarters when the post was active. The Main Gate in 1874. Twice. 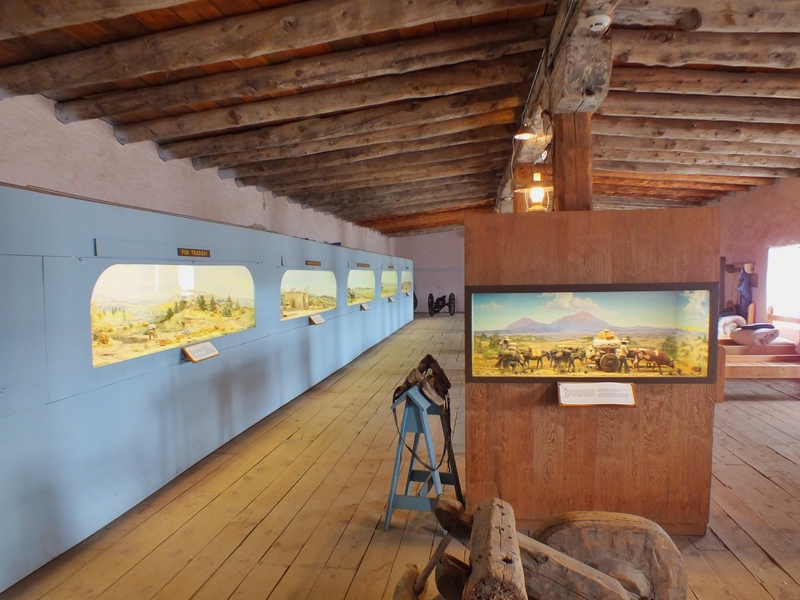 The Infantry Barracks, with dioramas of the history of the San Luis Valley. 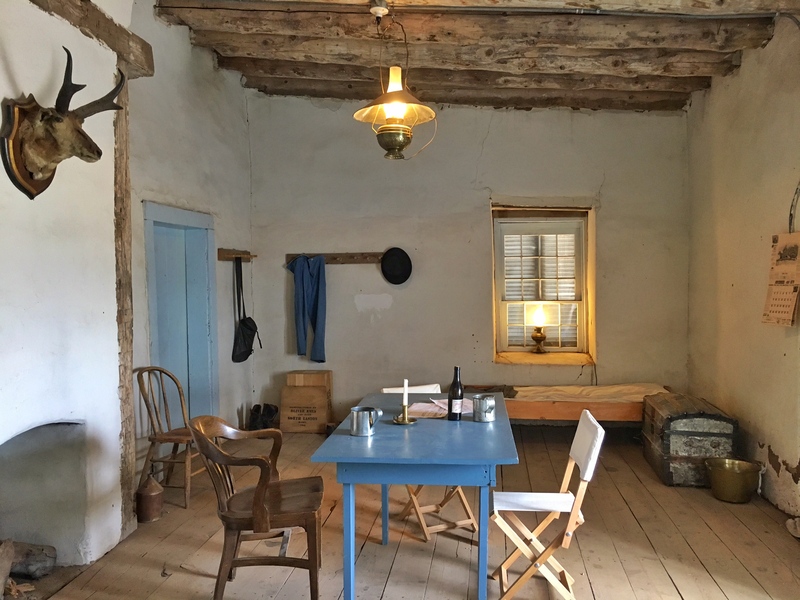 The Sergeant’s Room at the end of the Infantry Barracks. 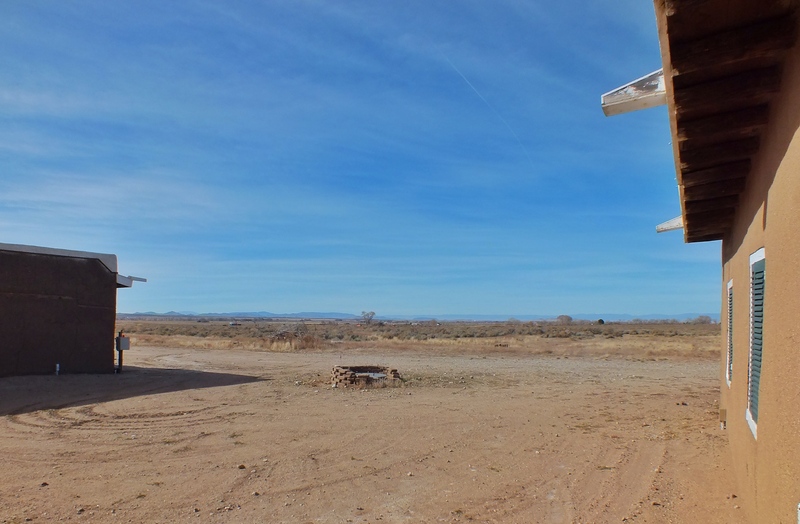 The view from in front of the Officers’ Quarters. 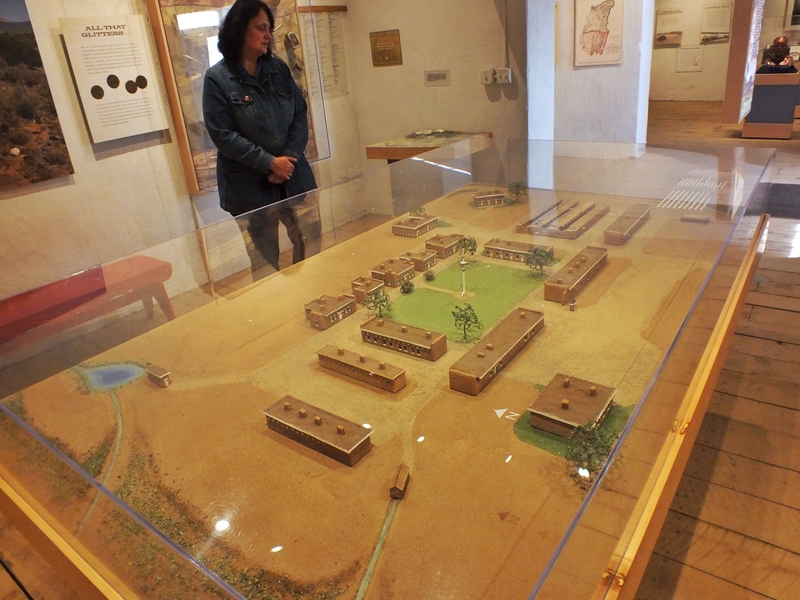 A model of what the fort looked like in its heyday. 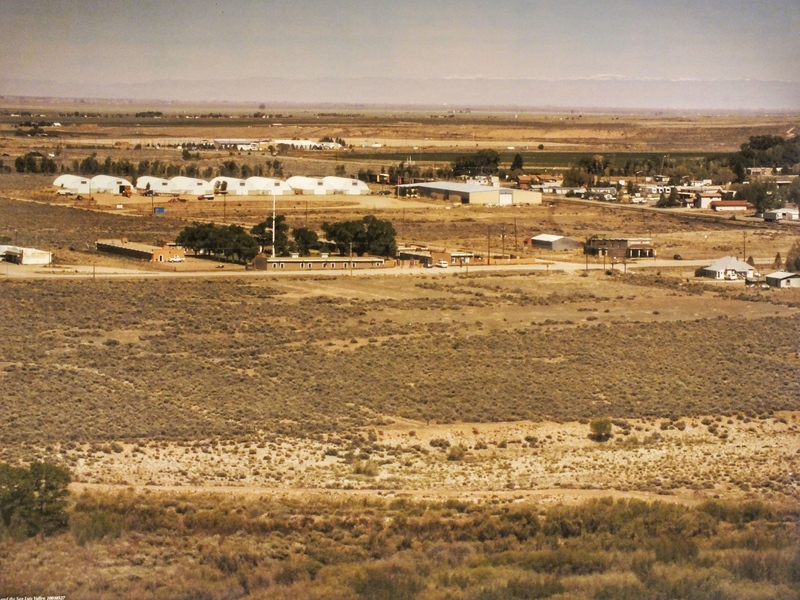 The fort in more modern times, with the town of Fort Garland. 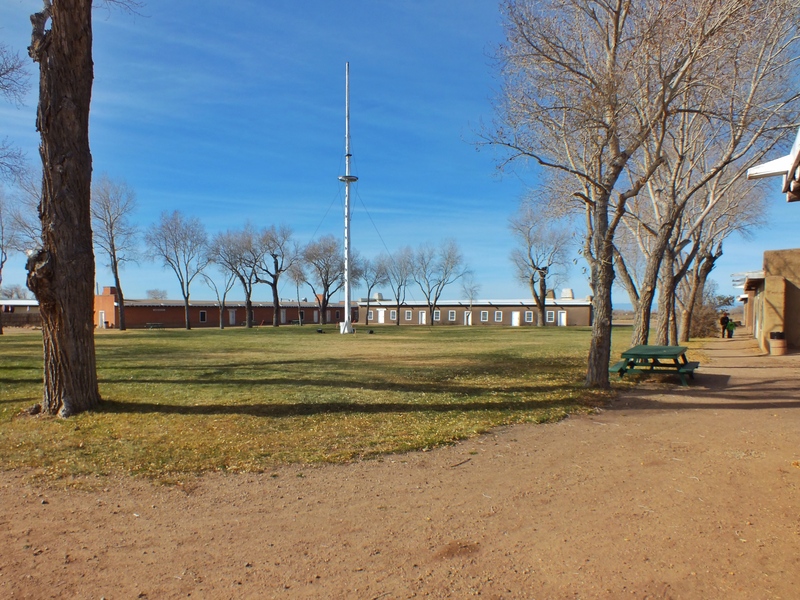 The fort from in front of the Officers’ Quarters. The Infantry Barracks are in the center. The Commandant Quarters. 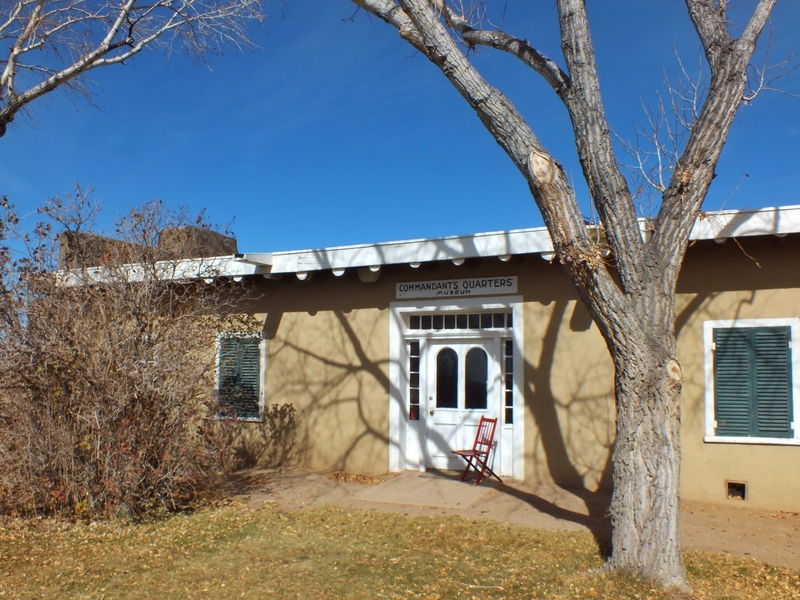 Kit Carson lived here with his family. 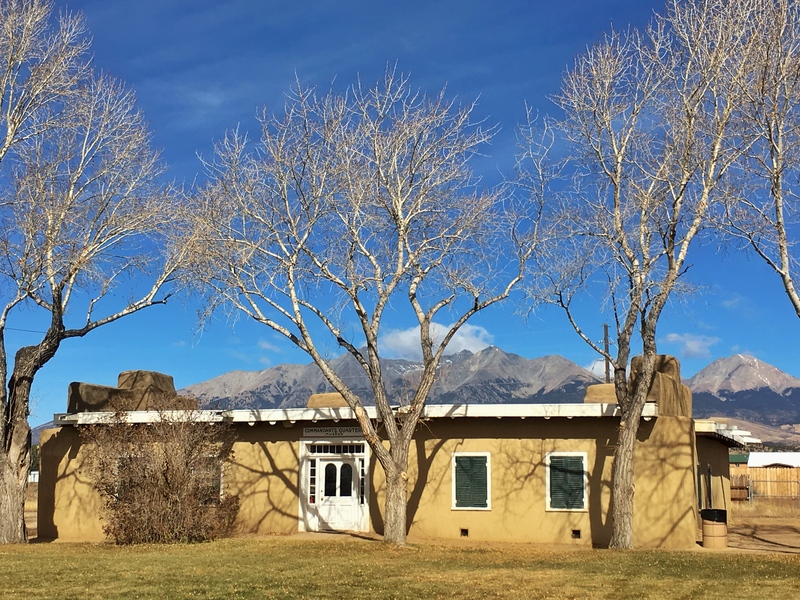 The Sangre de Cristo Mountains rise in the background. 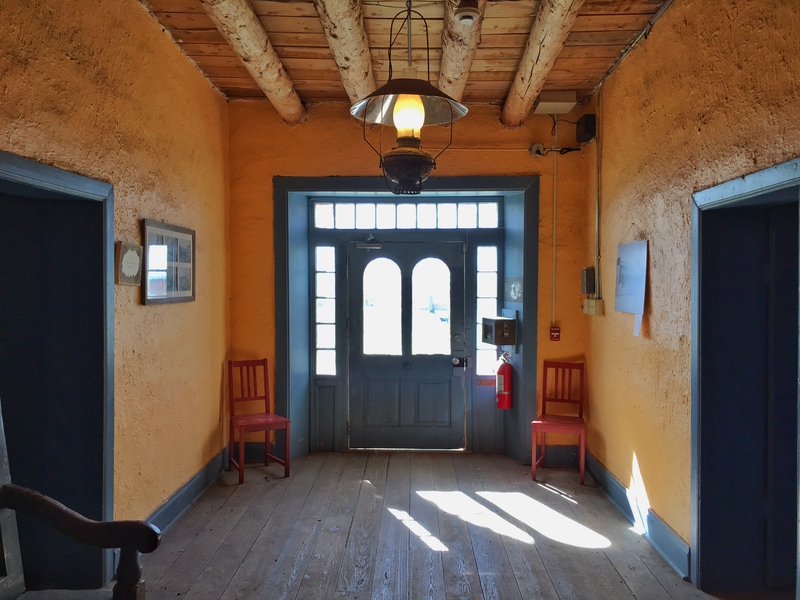 Inside the Commandant Quarters. 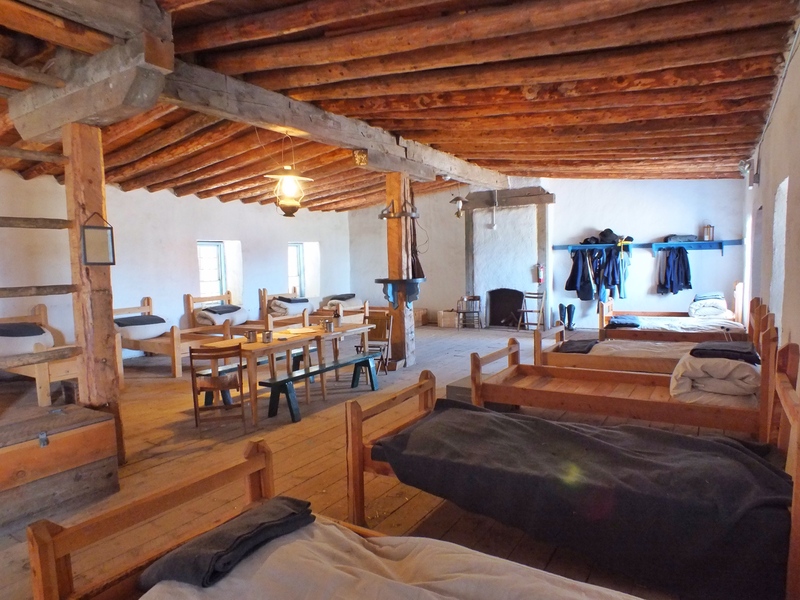 None of the furniture in the fort is original. 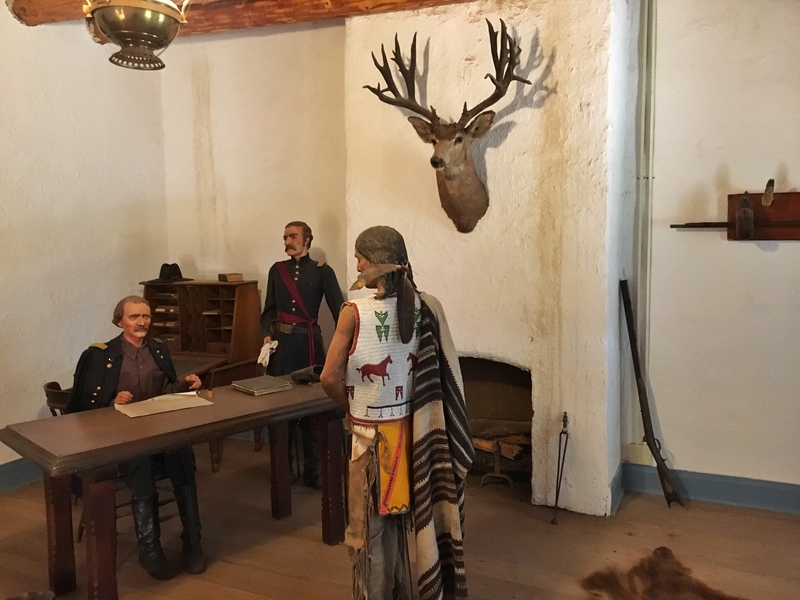 There was a case with a few items used by Kit Carson at some point. This entry was posted in Forts, Red Chair. Bookmark the permalink.